Welcome to our blog, where we share our thoughts, news, learnings and advice on everything from job advertising technology, to industry trends and advertising savvy. Joveo, the only truly transparent job advertising solution of its kind, launches our new platform, “Mojo”(Machine-optimized jobs). It truly embodies the company’s philosophy that media buying shouldn’t be a guessing game. The new platform has a suite of features allowing media buyers to do away with the day-to-day tasks. Instead, they can program the machine to make bid and budget optimizations, letting the system work for them. Even for complex campaigns, the platform eases the decision making with rich visualization and cross-media insights. The new look follows Google’s material design guidelines. Sleek and state-of-the-art, Mojo finally brings recruitment marketing on par with consumer marketing. Built on extensive customer inputs, it underlines Joveo’s product philosophy of “Customer First.” Early users of the platform have high regard for the visualization, comparing it with the likes of Tableau and Domo. For the first time in the industry, clients can dynamically create a unique AdWords or Facebook ad unit for each job. Having powered hundreds of millions of jobs, Joveo knows where talent lives and helps clients deploy these ad units to attract quality jobseekers. It provides proprietary tools for keyword suggestion, creative management, and advanced targeting options (including custom and lookalike audience modeling). These tools are proven to increase conversions by up to 20-30%. As a result, media buyers using this platform can effectively and efficiently utilize consumer media channels as a competitive source of applications and hires. Staying true to Joveo’s mission, Mojo now powers duration-based job postings. 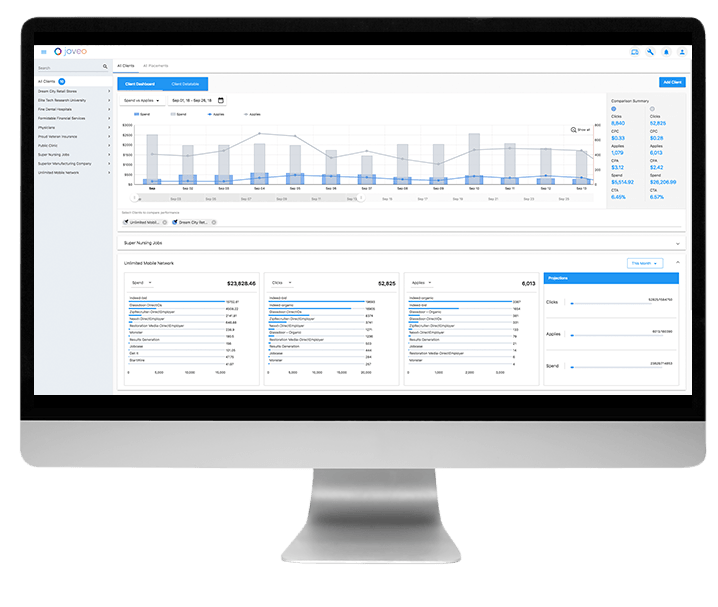 Recruitment marketing agencies, RPOs, staffing agencies, and job boards will now have the ability to compare all media channels in one single platform. Integrated reporting of job postings alongside other PPC channels enables visibility across CPC to CPH. “Joveo is the first and only really transparent job advertising platform. It is both easy to use and effective. The access to social media channels, job sites, Google Search and Display, and LinkedIn all on one platform save us time and money. If you are looking for higher quality candidates in a shorter time to fill, then Joveo is the tool for you. While others say they are revolutionizing the industry, Joveo is truly innovating by putting their customers first,” says Brett McCoy Head of Strategy, Media and Recruitment Marketing, Americas at Alexander Mann Solutions. “Over the course of nearly two years working with Joveo, we’ve been extremely pleased with the results and level of customer service we’ve received. Programmatic buying using the Joveo technology has improved the effectiveness of recruitment spend for all of our major clients. Joveo customer support has provided the transparency and visibility into results and metrics the J. Walter Thompson INSIDE teams need,” says Doug Shonrock, Managing Director/Atlanta & Director of Technology Products at J. Walter Thompson INSIDE. Joveo is a comprehensive, programmatic job advertising platform serving recruitment marketing agencies, job boards, staffing companies, RPOs and employers, globally.